Javier Collado Ruano (JCR): Dr. Katherine Müller-Marin is a native of Costa Rica who began her career as the Curriculum Planning Director at the Distance Teaching University of Costa Rica. She went on to serve at the Costa Rican Ministry of Planning and Economic Policy in Institutional Strengthening and Reengineering. She holds a Master’s degree in Education and post-graduate studies in Competitive Enterprises Management as well as two Doctorate Honoris Causa in Education. Ms. Müller-Marin is the current Representative of UNESCO to Viet Nam. She was previously UNESCO Representative to Peru. Prior to joining UNESCO, Ms. Müller-Marin worked for the Pan American Health Organization, UNDP, the World Bank, Interamerican Development Bank, the Organization of American States, Spanish Government Cooperation, the National Center for State Courts and USAID-funded programs in public sector reform. Sra. Muller-Marín, gracias por recibirnos con propósito del Día Internacional de La Paz. Katherine Müller-Marin (KMM): Gracias a ti Javier, por la invitación a colaborar en este número de Global Education Magazine. It is a pleasure to participate with the readers in this dialogue on the theme of Peace. 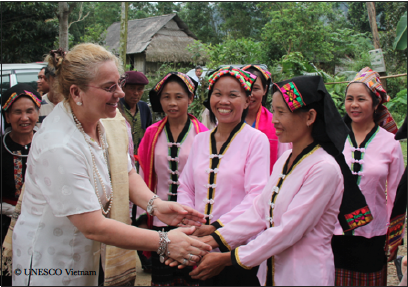 JCR: Dear Katherine, on June 8 you were awarded with the Insignia for Peace and Friendship in recognition of your active contributions to education and to preserving and managing cultural heritage in Viet Nam. What is the secret of your vitality to achieve such success and where does your passion come from? KMM: The Viet Nam Union of Friendship Organizations is an association that strives to promote peace, solidarity, and friendship among individuals and organizations worldwide. I have had the privilege of working closely with them for the past five years to foster scientific and cultural cooperation and to generate interaction between Viet Nam and many other nations through cultural diplomacy. The expansion of these types of partnerships is indeed a boost for passion and vitality. To receive this recognition is an invitation to continue working towards the task of building peace and promoting friendship in the hearts and minds of every person wherever I can, all the time. The rapprochement of cultures promoted by UNESCO fosters democratic participation, international solidarity and global responsibility and I strongly believe that Viet Nam, with its historical experience, capacity for tolerance and love for culture and heritage, can be an inspiration for the international community. JCR: How could we motivate our readers to live in a culture of peace? KMM: I personally identify with UNESCO’s values in the sense that I truly believe Education, Culture, Social and Natural Sciences, and Communication and Information are some of the most powerful drivers for sustainable development and peace, as a sustainable future cannot exist without sustainable peace. Raising awareness, capacity building, promoting understanding and respect for diversity, and fostering opportunities for interaction to find ways to ensure a culture of peace are all actions that will motivate people to become interested in setting peace as a priority for sustainable development. The International Day of Peace is a great opportunity to think about how, individually, each and every one of us can contribute to ensuring that resources are managed in a sustainable way, fostering values such as equality, social justice, and fraternity and thus reducing the potential for disputes and paving the road to a sustainable future. What do you think is the role of spirituality to raise awareness about the individual responsibility to confront global problems? What kind of challenges has UNESCO encountered in promoting Education for Sustainable Development? Did UNESCO achieve the goals proposed? KMM: The main challenge around promoting Education for Peace and Sustainable Development is that it implies behavioural change. Also, Education for Sustainable Development (ESD) has to be defined and adapted regionally, nationally and locally, for nations, cities and communities to understand their particular sustainability challenges, their needs and available resources as well as to empower them to undertake concrete actions and efforts to enhance the mindset of decision makers and all citizens. In Viet Nam, we are working closely with our national partners to make the idea of building a resilient, sustainable, learning society a reality. Together, we have already numerous accomplishments, such as increasing preparedness capacities for schools and communities, producing disaster risk management plans for World Heritage Sites, training the media on ESD and improving their reporting in related issues. Most importantly, we are bringing together community members, parents, school principals and vice principals, teachers, local authorities, officials responsible for emergency situations, media and national authorities to discuss the importance of taking joint and coordinated action on disaster risk reduction, climate change adaptation and mitigation, and biodiversity conservation, in a comprehensive manner and towards long-term solutions. I see a future where all citizens understand the importance of being proud of their natural resources, using them carefully, being inspired by them and most importantly working towards regenerating the biocapacity of our planet, to ensure future generations have a beautiful planet where they can be happy and live in harmony with nature. JCR: Could you tell us more about the current programmes between UNESCO and the Ministry of Education and Training (MOET) in Viet Nam? KMM: Viet Nam is at the midst of transforming its education system. A broad reform including a revision of the curriculum is being implemented. The Education Sector is making progress in responding to the country’s decisions on Natural Disaster Preparedness, Green Growth, and Building a Learning Society. Viet Nam is also piloting a new school model, the Viet Nam Escuela Nueva (VNEN) with the support of the Global Partnership for Education (GPE), to develop a new school and classroom experience for teachers and students. UNESCO is working closely with partners to support the Sector in the implementation of these programmes. Together with MOET, we also develop programmes targeting youth on healthier lifestyles through comprehensive sexuality education, gender-based violence, and bullying in schools. We assist Community Learning Centres and are supporting the definition of the future learning citizen and learning society for Viet Nam. UNESCO also promotes an inter-sectoral approach for strategic planning and assessment and implements programmes with MOET on Education for Sustainable Development and Heritage Education, building capacities for resilience, sustainable development, and the safeguarding cultural heritage. 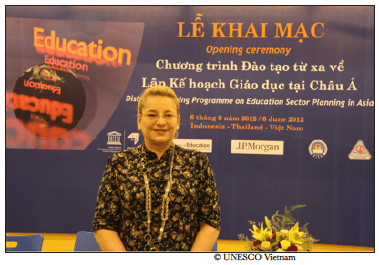 UNESCO stands ready to continue to build partnerships with all those striving to make education in Viet Nam an exemplar for the world. I believe Viet Nam is making important efforts in this sense and will be successful as it brings together all stakeholders as responsible and contributing citizens. JCR: What will the role of Global Citizenship Education be in the future? KMM: Education for Global Citizenship, in simple words, is education which understands and promotes interconnectedness and shared responsibility among citizens of the world. Technology and growing exchanges across national borders naturally imply that dealing with tensions, conflicts and challenges and threats to the sustainability of our planet have to be faced in a comprehensive manner. Global citizenship education should provide a new set of core values to develop enhanced knowledge, skills and, most importantly, attitudes to encourage respect for human rights, social justice, diversity, gender equality, and environmental sustainability among other values that promote mutual understanding and constructive relations. My personal belief is that a global community with responsible, caring and bioliterate citizens is the foundation of a happy, peaceful, and fulfilling life for all. JCR: Finally, what message would you like to send to our readers in the celebration of the International Day of Peace? KMM: As 2014 marks the 30th anniversary of the Declaration on the Rights of People to Peace, as per the UN General Assembly’s decision, proclaiming the sacred right to peace for everyone on our planet, it is of the utmost importance to understand that peace is an ultimate goal that begins in our minds and is reflected through our actions. This celebration is fully aligned with UNESCO’s mandate, recalling the need to strive for innovative and creative solutions to our challenges. As Ms. Irina Bokova, Director-General of UNESCO, affirmed in her message on the occasion of the International Day of Peace 2014, we must continue to ‘invest more in levers to build lasting peace, namely, respect for human rights, human dignity, and democratic values’. I would like to encourage everyone to take part in this celebration in different ways, but especially by taking a few moments to consider why aiming for universal peace is so important. Nourishing our attitudes and behaviours with these reflections on a daily basis can ensure peaceful relationships with others and the mainstreaming of peacebuilding and safeguarding actions in our work and lives. I sincerely want to congratulate Global Education Magazine for giving attention to this matter and for allowing us readers to have an opportunity to reflect upon “peace” as a way of life for the world and to share our thoughts and inputs. JCR: Thank you very much for your time and inspiring words, dear Katherine. I am looking forward to see you again to learn more about your rich experiences.